This shop has been compensated by Collective Bias, Inc. and its advertiser. All opinions are mine alone. I owe a BIG THANKS to Wal-Mart for carrying such healthy food options like Maranatha Almond Butters and all the delicious ingredients used in this recipe! #StartAHealthyRelationship #CollectiveBias #CBias. I don’t know about you, but my breakfasts can get a little monotonous. Smoothies and eggs with sauteed veggies are my go-tos day after day. 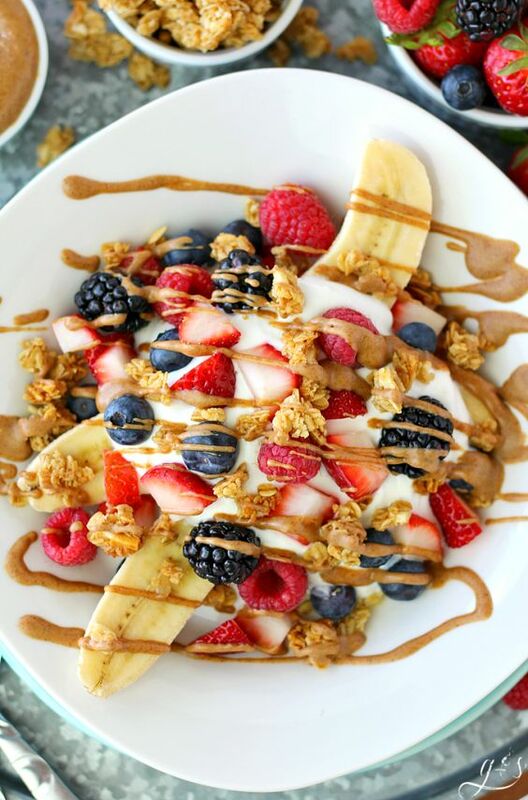 However, this Breakfast Banana Split is a welcomed addition with it’s fresh fruit, healthy fats from the MaraNatha Creamy No-Stir Almond Butter, and protein from the plain Greek yogurt! This healthy, easy, and clean eating recipe makes the perfect breakfast or snack. MaraNatha Almond Butters pair perfectly with protein-packed plain Greek yogurt, tasty fruit, and gluten-free granola! Kids and adults will love this for a fun dessert too, maybe add a few chocolate chips! If you need a break from eggs, smoothies, and oats try this low carb weight loss idea to kick up your mornings! For more recipes like this check out groundedandsurrounded.com! Peel your banana, cut it in half lengthwise. Place the 2 banana pieces side bt side in a shallow bowl or on a plate. In a small bowl mix the plain Greek yogurt and vanilla extract together. Pour on top of the bananas. Spread berries and granola on top of yogurt and drizzle with the MaraNatha Creamy No-Stir Almond Butter. If your almond butter is not "pourable", scoop it into a small bowl and heat for 15 seconds in your microwave. 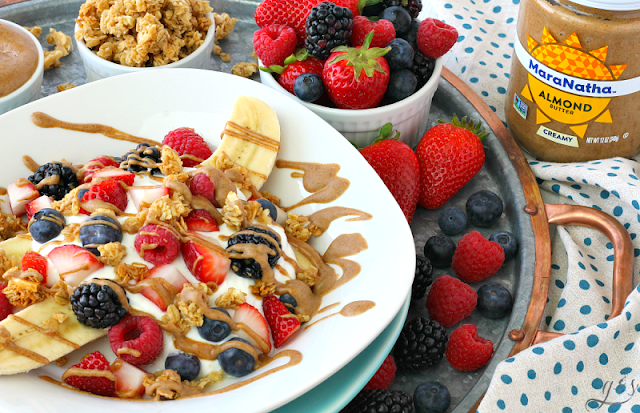 Then drizzle on top of your banana split to complete your healthy breakfast recipe! 0 Response to "Breakfast Banana Split w/ MaraNatha Almond Butter "